Who messed up the timing of the Valencia street lights? It used to be that I could zip straight from 25th to 16th (heading North, that is) on my bike without having to stop a single time, because the lights were perfectly set up to be a bitchin’ bike corridor. Now I always gotta stop around 20th and 21st. Why? Who killed the good light timing? I’ve also noticed this alarming trend, not just on Valencia Street but also on 24th where the same 13 mph speed could be employed from Folsom to Valencia (and probably Guerrero) to get through every green light with plenty of time. Now I seem to always get stuck on Capp unless I seriously gun it. Are these changes the result of some recent decision to move away from the Green Wave initiative, or could they just some random coincidence or malfunction that upset the timing of the stoplights? Anyone know what’s up? 14th street suffered the same fate about 2 months go. I could go Guerrero->Folsom without stopping. Now I stop at 3 lights during this because they are all out of sync. Someone screwed up. I would love to know who. Yep, biked down 14th yesterday and used to be if you caught the Dolores green light heading downhill, you’d make it to Rainbow at speed. WTF? Also, hit a meeting in Diamond Heights last weekend and got to bike down Market from Portola for the first time headed for the SF Center at 5th. It was amazing until I got to Sanchez, where I had to stop at 2/3 of all lights until I got to 5th. WTF? Used to fly down 14th from dolores to best buy in 5 mins. Seriously, can they fix this? Call 511 and find the appropriate department (MTA?) and report the issue, it could be a simple malfunction. 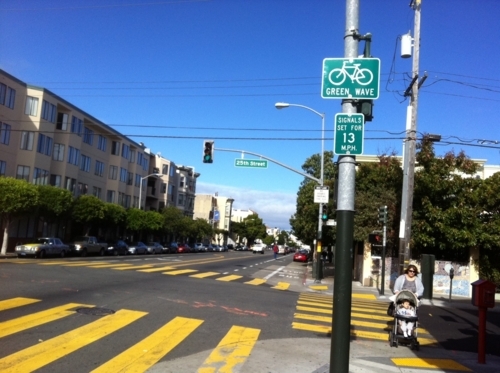 Bonus side-effect, when turning left onto Valencia from WB 17th, you can now make the light at 18th. Also, I’m really jazzed that they’re repaving all of 17th. Hopefully they’ll finally remove some of the parking between Treat and Potrero while they’re at it. whew, glad i’m not the only one to notice this. i just thought i was getting slower at riding my bike. Just gun through the red lights and stop signs like you normally do. (Then when you get hit, blame it on the car). i can just imagine your smiling smugly to yourself from the safety of your lonely masturbation cave as you came up with this one. B+! It’s a maintenance issue–MTA was notified 2+ weeks ago and they’re supposedly on it. Also, apparently the lights go out of sync for “a few minutes each day” while doing regular maintenance. yeah just run the red lights, who cares? Stops signs too. THE ROAD IS OURS! Cars must be replaced with bikes! I called 311 and submitted a maintenance request. It took about 5 minutes. Go to http://www.sf311.org/index.aspx?page=4 and track request # 1143234. If it’s not fixed in a few days, someone else should call. The more of these calls they get, the more likely it is to be fixed. While you’re calling 311, submit a request for a bike rack in front of The Dark Room! 2263 Mission @ 19th! Apparently we just need a few more! SFMTA stenciled for one new bike rack (two bike parking spaces) in front of this location, which should be installed later this month or early July. Folsom & Howard streets have been purposely un-synced. Is it just me, or is Howard excessively miserable? Any sort of power outage will stop the clock (often mechanical) of the particular light. Unless it is manually resynced it will mess up the timing. The signal infrastructure underground connecting the signals is aging and failed. Another way of synchronizing the signals is being implemented so the green wave can be restored in the next 2-3 days. Seems to be back up. Just went from Army to Seventh without a stop and without much effort. my friend can use binary code to induce a red light(with the hand push signals)..so they may be semi-intelligent(semi-sentient???..crazy..huh? )another friend of mine submitted this to the blog here ;but the censors on this web-site quickly pulled it..got through this time..do not dought this web has “watchers” who track comments from certain individuals. 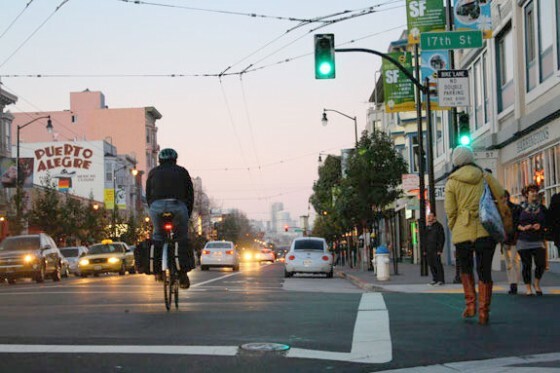 C’mon, you don’t seriously expect us to believe bicyclists actually stops at those red lights? how else do you think we practice our trackstands? I suggest you call the traffic department. They should sort this thing soon. your blog. I as well am an aspiring blog writer but I’m still new to the whole thing. Do you have any points for inexperienced blog writers? I’d definitely appreciate it.